Debra writes for the JTA, and is a former features writer for The Times of Israel. It’s a Sunday night in Tel Aviv, and HaArba’a Street, the restaurant-packed drag that runs alongside the city’s Cinematheque complex, is filled with hungry couples looking for dinner, and groups of tipsy teenagers heading to one of the area’s nightclubs. There’s an excellent sushi restaurant on this street, a well-reviewed Spanish tapas joint, and a handful of reliable burger restaurants that do good business with young families. 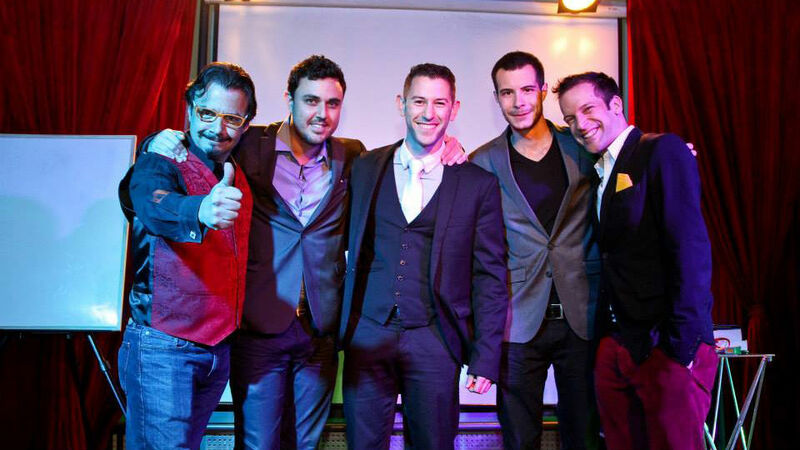 But on Sunday nights for the past several months, there has also been a new attraction: a grown-up magic show, geared directly to Anglos and offering, for the first time in decades, an English-language entertainment act in the heart of the first Hebrew city. Liwer travels a lot for his day job, and whenever he goes abroad, he has a tradition to escape the doldrums of solitary business travel: check the local Time Out or Village Voice-like publication, find a magic show or comedy act, and wile away the hours between dinner and bed with laughter and some English-language company. 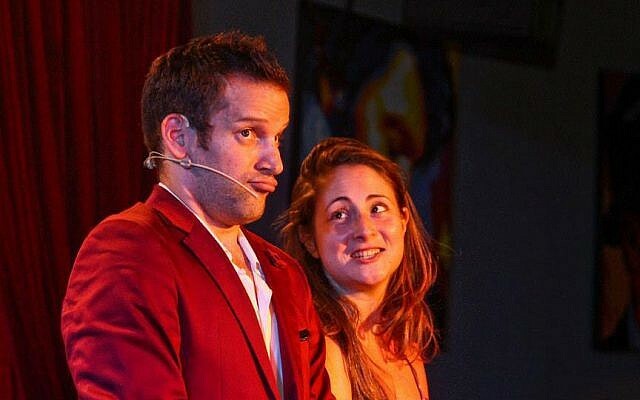 In Israel, however, a nation packed with both ex-pats (some 500,000 immigrants live here permanently but still speak English as their primary language) and drawing record numbers (about 2 million) of English-speaking tourists each year, there is a dearth of entertainment options for non-Hebrew speakers. Hotel concierges are trained to point their guests to restaurants or bars in the evening, or encourage them to spring for tickets to the opera, the ballet, or subtitled movie screenings. But what about folks who just want to relax and be entertained, and – like Liwer – who love the allure of a stage show and some laughs? There was a gap in the market, he realized. And as quickly as you can pull a rabbit from a hat, the idea for Sorcerers’ Night was born. 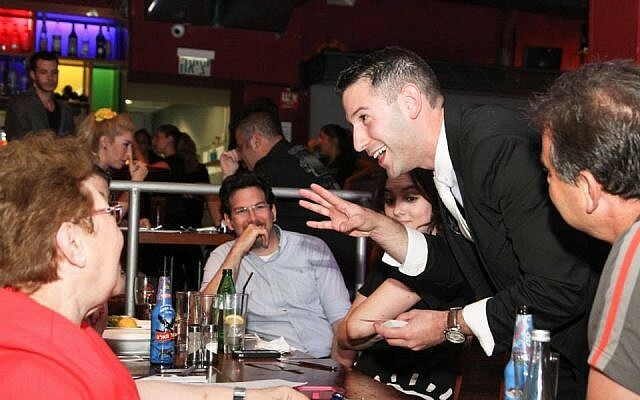 Fate, Liwer felt, was sealed after he attended a bar mitzvah of a family friend where Itai Pinki, a magician and comedian, provided the entertainment. The two talked long into the evening, and a few days later, Liwer pitched the idea of the two going into business together. Their first challenge was finding the right space: they wanted a spot in central Tel Aviv, where patrons could eat at restaurant-style tables but still see the stage. They needed a kosher kitchen so anyone could feel welcome, but they needed that kosher food to be at a high standard. They needed a full bar, and they wanted to make sure they were in a high-traffic area. They found a great spot, but it was near Tel Aviv’s Central Bus Station, in a run-down neighborhood south of the city. 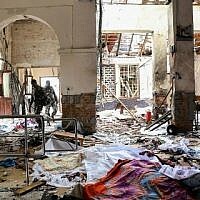 They nixed it, for fear tourists would be scared away. They found a few other great locations, but none of them could offer kosher food. Finally, they landed on Punch Line Tel Aviv, a hybrid bar/restaurant/disco on one of Tel Aviv’s best culinary streets, with seating for 200 people and a great, liberal-handed bartender. Liwer refuses to sell all 200 seats, offering only the 120 with the best view, and he says so far, the combination of atmosphere and quality menu is working for them. It’s not Hogwarts, but it will do. 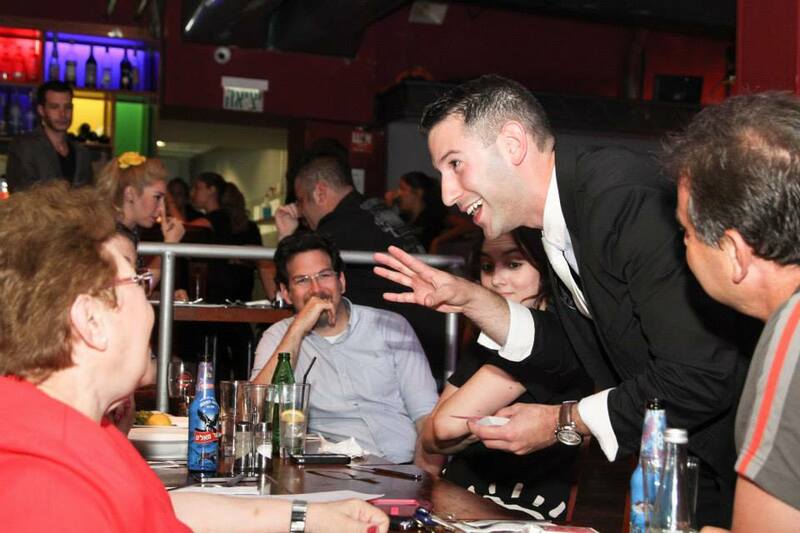 The next task was recruiting talent from within Israel’s magic community. 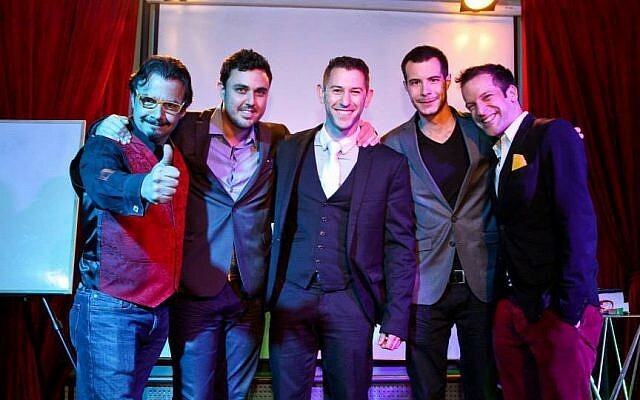 They needed magicians who could perform in English, which at first proved limiting, but as the shows began attracting fuller audiences and racking up positive reviews on TripAdvisor, soon illusionists were coming to them and asking to be included in the line-up. 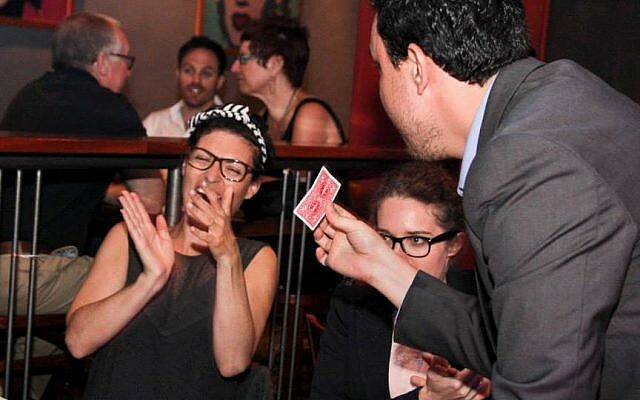 An evening at Sorcerers’ Night features five or six performers, who kick off the evening by strolling from table to table and performing close-up magic: they shuffle decks of cards only to make all the aces vanish, or they chat with a female patron only to pull her husband’s watch from their pocket a moment later. 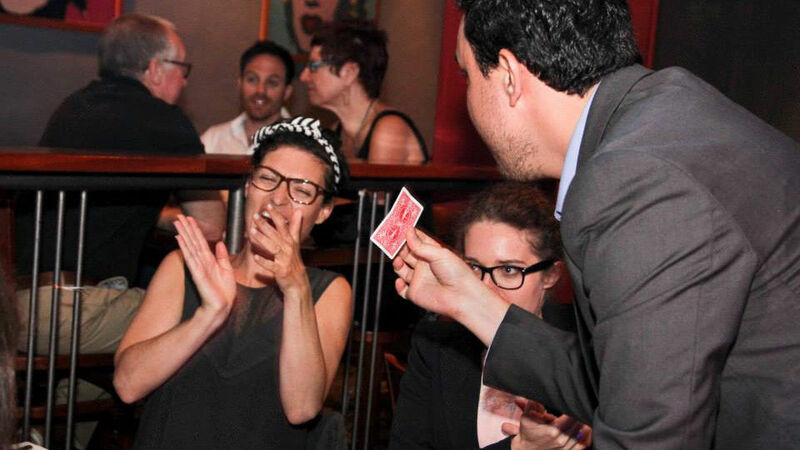 After the ice is broken and ticket-holders have ordered some food and drinks, the show moves to the stage, where a nightly show will offer a variety of illusion tricks, mentalism, and plenty of comedy. 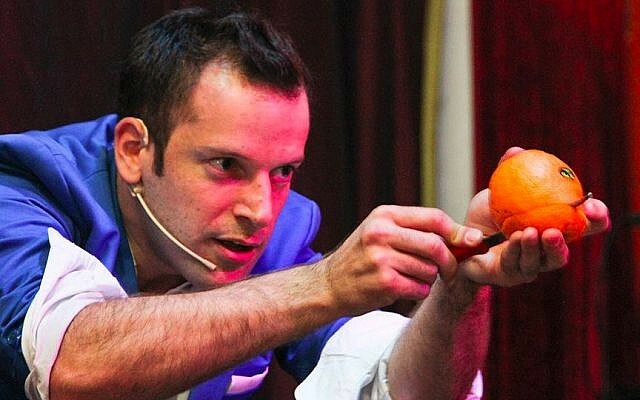 Despite the strict English-only policy, the audience tends to be a mash-up of both English- and Hebrew-speakers, which Liwer attributes to the fact that the Israeli magic scene is still quite sparse. 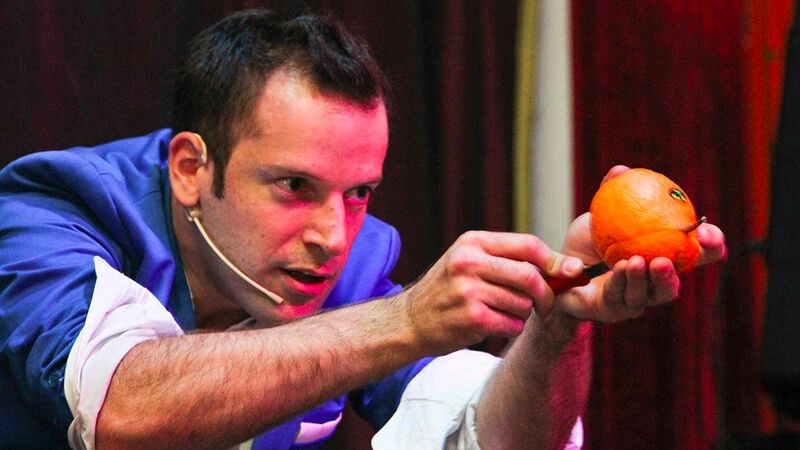 For sabra sorcerers, there just aren’t that many venues where they can watch a top-notch magic show and indulge their love of illusion. Liwer doesn’t perform – he says his skill level is still several notches below the quality level he insists from his magicians – but he still manages to indulge his love for conjuring by serving as MC and host. 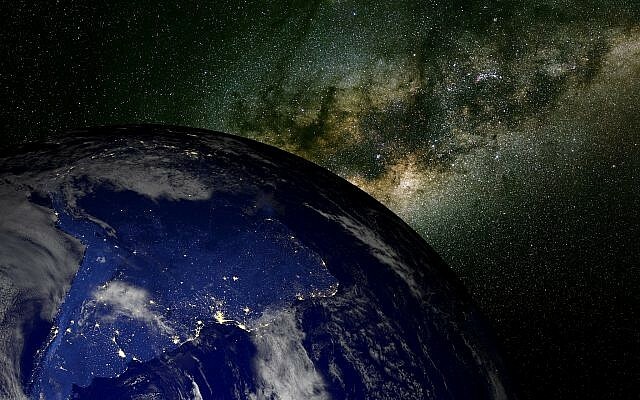 The business venture is still purely a side project and labor of love, and he admits that in addition to keeping his day job, he is actually still losing money on the project. But he has big plans for Sorcerers’ Night, and hopes to eventually fashion the show into a double feature, with a kid-friendly performance in the afternoon followed by an more mature adult-geared show later in the evening. They’re doing something right, though. 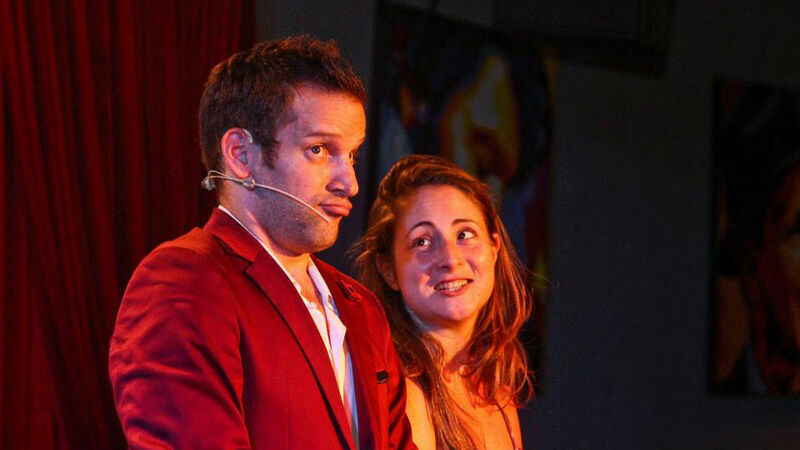 Most shows are sold out, and the act is rated the #1 attraction in Tel Aviv on TripAdvisor.